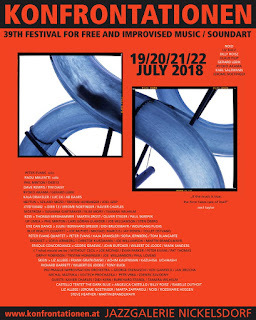 Prende il via oggi a Nickelsdorf (Austria) una nuova edizione del festival internazionale di musica improvvisata Konfrontationen, quattro intensi giorni di concerti e incontri nell'accogliente e informale ambientazione della Jazzgalerie, con ospiti una settantina di musicisti di varia provenienza e formazione. E con uno speciale pensiero a Cecil Taylor, che così esprime Paul Lovens: "Dieses Festival ist nicht Cecil Taylor gewidmet, zollt ihm keinen Tribut: denn man darf sich nicht mit dem Namen eines verstorbenen Genies schmücken. Deswegen spielen wir auch nicht "in memoriam" seiner. Wahrscheinlich aber würden wir heute nicht eine solche Musik machen, wäre er nicht seit mehr als einem halben Jahrhundert visionäres Vorbild. Nur einige von uns haben direkt mit ihm gearbeitet, wenige sind ihm begegnet, viele haben ihn nie "live" gehört. Weg ist er, doch immer da. Die Jungen sind erwachsen, die Alten dürfen sterben." Jazzgalerie Nickelsdorf invites you to Konfrontationen 2018 – International Festival for Free and Improvised Music. The 39th edition of our four-day festival brings together 68 musicians, who play 19 concerts at three locations (in the Jazzgalerie courtyard, at Kleylehof and in the Protestant church). A special treat this year are the big ensembles: the Castelló Tentet / The Dark Blue combines electronic noise with delicate instrumental passages to create a magic horror-movie atmosphere; the eleven-piece Prague Improvisation Orchestra works with guest musicians and graphic scores to paint a Central European landscape with musical devices; the electro-acoustic septet Skein seems fascinated by flocks of birds in flight; and last but not least, the all-star octet Without Cecil, which like so many of the musicians that have played in Nickelsdorf over the past decades sees the late pianist and poet as a visionary genius and his radicalism an inspiration to the international avant-garde. At the other end of the spectrum are the solo performances: from virtuoso playing to subtle reductionism, the adventurous US trumpet player Peter Evans and Austria's grand seigneur of avant music, Radu Malfatti, explore melody as a series of musical events and silence as sound. Between these poles you can explore a range of bands that make improv hearts flutter: whether their name reminds you of a beat boxer's sound poem (BZSS) or a password-protected number plate from France (J77D13X442), whether they come all the way from Sweden like Up Umeå or just pretend to, like the three-girl combo Möström, whether its members will be playing for the first time in Nickelsdorf, as for instance Dave Rempis, Michael Marcus and Szilárd Mezei, or are familiar faces like Phil Minton, Georg Graewe and Sofia Jernberg, whether they prepare the piano like Kaja Draksler or prefer to take it apart like Juun – if you come with open ears, you will not be disappointed.